In Step 1 of the spiritual road map to your financial rebirth, we broke off the curse of not tithing. Right? Step 1 requires us to begin tithing so that we can be blessed and have the curse broken off our lives in this sinful world. In Step 2, we broke off the curse of speaking (or believing) less of the Jewish people than they are. Although this may seem random, it is essential to be free of that curse if you want to progress financially. You want God to bless you, not curse you; and He can only do that if you bless Abraham and the Jewish people. If you do not, He must curse you by His own covenant word to Abraham. In Step 3, we are now going to talk about how you can shatter the curse of bad stewardship, so you can start to receive the blessings of good stewardship! This is the third and final curse (that I know of) that can be on your finances. After we get all these curses broken, we can start taking steps to move forward UP the mountain (since we will have finished digging out of the hole dug for us by these curses). So what is the curse of bad stewardship? In the parable of the 10 talents (Matthew 25), Jesus tells us that we are expected to manage whatever we have well—even if we only have a little bit. And all of those mindsets will put your finances under the curse of your own mis-management. Before the Lord started walking me down this spiritual road map to financial rebirth, I was a terrible manager of money–and I reaped the bad consequences. I wasn’t saving. I was eating out all the time. My budgeting method was based more on “How do I feel about my bank account today?” than it was based on any numbers. And my finances showed it, too. My finances were a mess. Then I realized that I would have to do something about this if I didn’t want to live like that the rest of my life. And things are not going to miraculously get better until you—yes, you—change. That is the realization I came to for my own finances a number of years ago, and it was a tough one. But it was also empowering. It was tough because I had to stop pointing fingers at other people. I had to stop saying I wasn’t paid enough; that my bills were too high; or that handling money was hard. I had to stop saying I need that new necklace, or that expensive dress from the clothing catalog, or those candles from the direct-sales party, or anything else. I had to admit that I was in charge, and nobody was going to fix my finances except me. Every step I chose to take would get me closer to my dream. Every dollar I saved would give me more peace of mind and keep catastrophe at bay. Everything I read in the Bible about money was something I needed to obey; and if I didn’t, I was the one disobeying God. And I didn’t want to disobey; so I knew I could start walking in obedience. So what is the first step I took after that? It was REALLY simple. Why does a verse about flocks and herds matter? Because Israel was an agrarian society! The children of Israel were farmers and shepherds! Their flocks and herds determined their net worth. So, this verse is the equivalent of talking about our bank accounts, assets, liabilities, and every other aspect of our finances! Then, just because I am a total nerd AND I knew it would motivate and inspire me, I plotted my balance for the major accounts (not including my mortgages) on a line graph in red and green. I used a red pen/marker to draw the bad balances (“liabilities”), and a green pen/marker to draw the good balances. Terminology note: Going forward, I will sometimes refer to “assets” and “liabilities.” An “asset” is something that MAKES you money. A “liability” is something that costs you money. So on my line graph, I used a red pen for all my liability accounts and a green pen for all my asset accounts. (By the way, click here: Blank line graph to download a blank line graph like the one above, in which you can enter your own dates and numbers). And every time I got my paycheck from my job, I wanted the green lines to go up and the red lines to go down–even if it was only by a dollar or two. So every time I got paid, I would make my budget for that pay period. (We’ll talk about how to do that soon.) Then, I would try to either pay a little extra on a credit card or put something in savings. And when I did, I would make a new dot on my line graph for each account and draw a new line in either red or green. It was fascinating and SOOOO motivating and inspiring to see those lines move each pay period! And by making that list of all my account balances–both good and bad–I was suddenly inspired to start working on them. Find out what your balances are on all your various accounts and bills—even any past-due bills. Make a list of every account by name and balance. When you don’t know exactly what’s going on with your finances, the spirit of intimidation comes in and will intimidate you to try to keep you from handling God’s money purposefully. The fear of the unknown is usually worse than the actual “known.” As soon as you get everything out into the light, however, the fear goes away. And that is sooo true. The menace you can’t see can be lethal. But as soon as you get the thing out and expose it to the light–even if that “thing” is your credit card balance, a non-existent savings account, or a negative bank balance–it can’t hurt you anymore. Exposing a threat helps to render it powerless. So go ahead and expose those sharks that are lurking in your finances, okay? Get those balances. Write them down. Make a list. Then, in the next post, we’ll talk about how to bring blessings upon yourself through intentional stewardship. hi Jamie, which blogs detail the first two steps? Are you able to post a link to them please? TIA. Love all that you do!! The links are at the top of the post. 🙂 Thanks for reading! Big hugs to you today, Maz! Amen. Have been budgeting for several years now and am also charting out the full state of my flock. It is my desire to be a much better steward than I have been during various times in my past. It is time to move forward in faith and in Abba’s purpose unhindered. Thank you, Jamie. Need and appreciate your prayers. I’m also heavy and prayerful for others who are overwhelmed, and ashamed of needing to take steps to come into alignment in order to receive the abundant blessing of our Father. The ones reading, and desiring, but keeping quiet, feeling they are a lost cause. Abba loves you, forgives you and extends His grace to you today to take a step of faith. More grace poured out with each step of faith you take. We receive Your grace and move forward surrendering EVERY area of our hearts and lives to obey You, Lord. In Jesus’ name, Amen. I will pray for you today! Hang in there! You are doing great. One step at a time! 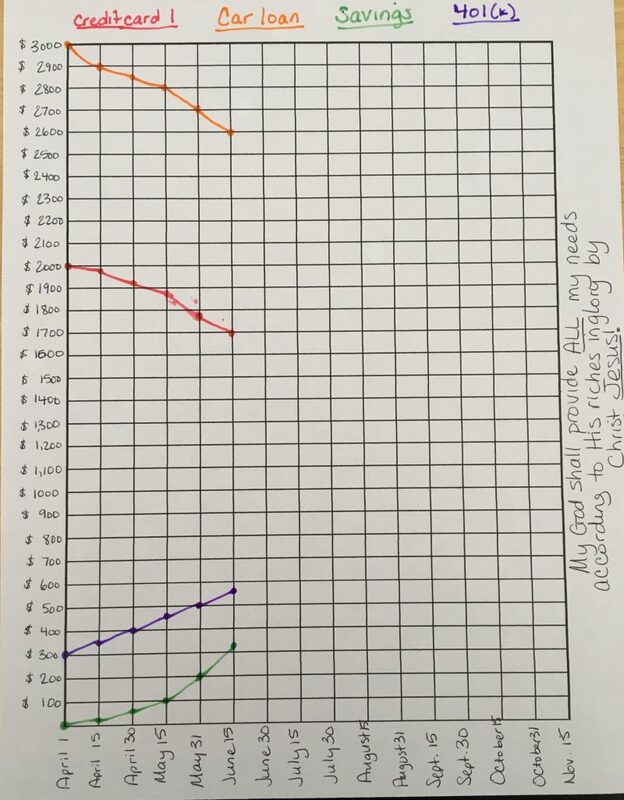 Jamie, Do you have a picture of the line graph you created? I would like to see a visual if you have one. Thank you. Have a BLESSED day! I don’t have the original one anymore, but I just created a sample and added it to the post above, with a blank line graph you can print out (and add your own numbers) if you want to. 🙂 Hope this helps! Thank you so much for this. I had been led to do this so started gathering up my statments and so far i have only tallied up the liabilities. I’m not sure of my assets. But there are some because I have a retirement plan. Praise God for wisdom. I look forward to more post to become a better steward.